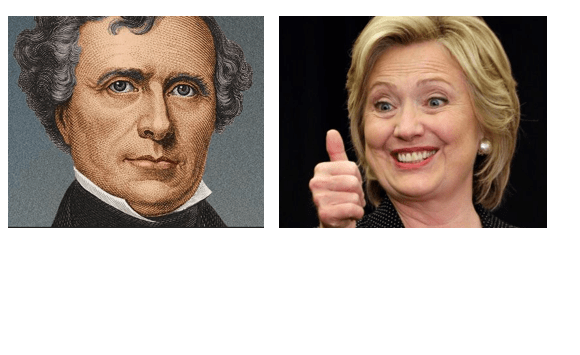 James Buchanan did something that Hillary Clinton could not do, nor could any other Democrat since the election of Buchanan in 1856. Buchanan succeeded another Democrat by election without previously having ascended to the position because of the death of his predecessor. Hillary Clinton could not do this nor could a number of other Democrats since 1856. Here is the list of back-to-back Democratic presidents from the time of Franklin Pierce’s election in 1852, followed by Buchanan’s four years later. 1948 Harry Truman Was FDR's VP and became president following FDR's death in 1945. 1964 Lyndon B. Johnson Was JFK's VP and became president following JFK's assassination in 1963. However, if presidential elections were decided by popular vote rather than the Electoral College, there would have been three more examples of Democratic back-to-back presidencies. What can we learn from these results? The first is obvious. The United States should elect its president by popular vote. The second is that Democrats have not succeeded recently in providing the American people with an agenda that they can embrace for an extended period of time. When it comes to economic issues, Democrats have clearly had preferable agendas to Republicans from the time of FDR to the present. However, Democrats have lost when the so-called social issues have seemingly been more important to a wide swath of American voters than economic ones. The social issues that propel Republicans to office are often fueled by hate. That seemed to be the winning formula that propelled Donald Trump to win the electoral college, although we all know that Trump may well have lost that as well were it not for the PC factor (Putin-Comey). The economic platforms of “losing candidates” Al Gore and Hillary Clinton definitely would have benefited many of those who voted against them. However, what Democrats have been missing almost since the FDR-Harry Truman days and perhaps LBJ days is a visceral appeal to the white working class. For too long, the people in this group have been tag-alongs for the Democrats. We now need to include them much more prominently in our politics of identity.